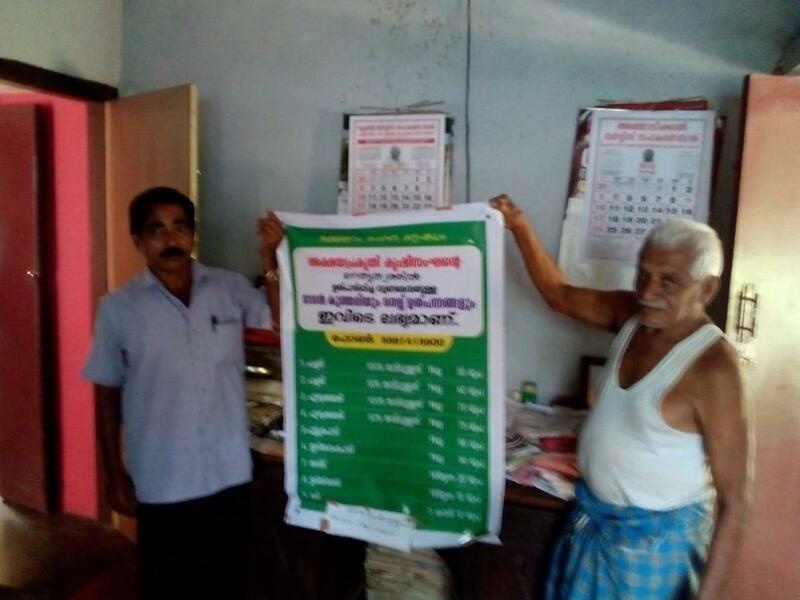 Zero Budget Farmer, K. Narayanan (who is all of 85 years old) holding up his price-list for the paddy he grows and sells directly to consumers. He is one of those "unorganized businesses" that is not just growing the economy but also improving the nation's health and environment. Also seen on the left is "Augustine" SVS Kerala Volunteer and Community Activist. The Center for Monitoring the Indian Economy announced in January 2019 that nearly 11 million people lost jobs in 2018 after the demonetization of high value notes in late 2016 and the chaotic launch of a new goods and services tax in 2017, which hit millions of small businesses. Understandably the Finance Ministry is embarrassed about this development and reported to Parliament in December 2018 that it did not have data on the impact of demonetization on jobs in small businesses. Professor R. Vaidyanathan, who teaches Finance at IIM Bangalore, probably first popularized the phrase “India Uninc” with his book of the same name*1. Since 2014-2015 (around the time his book was published), more attention has been drawn to the so-called “Unorganized Sector.” With the nation’s unemployment figures being at record heights (7.2 percent according to data compiled by the CMIE). figures were not published. Leaked data suggests that the unemployment rate is now at its highest in 45 years! Hence the need for many more small business jobs. The good Professor points out that many of these partnership and proprietary firms, a good number of whom are in the retail sector) account for vibrant growth, despite governmental policies that stack the odds against these brave and growing self-employed individuals. There has also been a resurgence of agricultural ventures with many urban young people turning to organic farming and agro-engineering activities. Says Nagesh Kini in his review of Vaidyanathan’s book, “Next only to agriculture’s 17.5%, wholesale and retail trade contribute16.6% and manufacturing 14% of GDP. Their growth rates have been 3.6%, 9.2% and 8.4% respectively (when the Gross National Domestic Product was 8.3%). Captain Raghu Raman, Group President of Reliance Industries features in a video “India Uninc: Management Lessons from the Streets of India,”* 2 that has gone viral. Captain Raman was speaking at a meeting of the Nashik Business Association when he announced that 50 percent of India’s GDP and 90 percent of employment came from the unorganized sector. According to him, the return on investment per square foot here is exponentially higher. The Captain also pointed out that a vital benefit of the unorganized sector is that revenues are shared more equitably. He says, “the sad truth is that the corporate sector is not going to be able to fulfill the aspirations of our young people. We need to stop young people with humble backgrounds from being forced into working as daily wagers when they can with a little marketing support become micro entrepreneurs. Says Aarati Krishnan writing in the Hindu Group’s Business Line (September 4, 2015) ; “While India’s listed universe boasts of just 6,000 companies, at last count the country was home to 3.6 crore MSMEs (Micro, Small and Medium Enterprises) which employ 8.05 crore people”. The All India Council for Technical Education (AICTE) estimates that of over eight lakh qualified engineers in India, 60 percent are unemployed. Part of the problem may be that that only 15 percent of the 3,200 institutions that offer engineering courses are accredited by the National Board of Education (NBA).